Do your New Year’s resolutions include financial independence, truly enjoying your work, or being your own boss? What if you could do all those things at once? Embrace the enormous potential of TapSnap – a franchise where you can earn more money in one day than most people do in a week. Imagine the possibilities of part-time work with full-time pay. 2015 could be the year when you work less, make more, and love every minute of the time you do spend working! You can even run a TapSnap franchise on the side while you still hold a full-time job, as most TapSnap events take place on evenings and weekends. TapSnap is a photo entertainment platform, unlike any you’ve seen before. TapSnap engages and entertains with a fun and interactive photo booth experience that appeals to all demographics. Guests have their picture taken with our professional DSLR camera, they then play around with their photo on our 42-inch touch screen to add in digital props, pick fun green screen backgrounds, and write messages onto their pics, which they can then instantly share via Facebook, Twitter, and email. 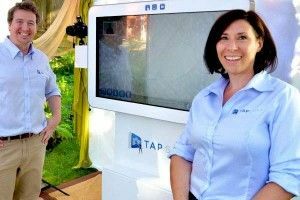 TapSnap franchisees find themselves at all types of events – from weddings and Miztvahs to product launches and movie premieres. They oversee the bookings, marketing, staff, and fun for their franchise. While their Phototainment Specialists are entertaining the crowd, they’re interacting with guests and booking even more events. Does entertaining guests at exciting events sound like your idea of a great new work environment? Are you looking for a fun, flexible, financially independent life in 2015?